Queen Nefertiti: Has the tomb of Tutankhamun’s mother been found hiding in plain sight? A British archaeologist by the name of Nicholas Reeves may have just solved one of the most enduring mysteries of ancient Egypt. His groundbreaking research suggests that in the tomb of Tutankhamun, the most famous of Egypt’s pharaohs, is hiding a secret that has eluded researchers since its discovery more than 90 years ago. The body known as the “younger lady” is suspected to be Nefertiti, if proven it could also place her as the mother to Tutankamun as the mummy is the biological mother of the boy king. A diagram of Nefertiti’s possible resting place. Two secret doorways may exist coming from the walls of the main chamber. If Reeves is correct, the room containing Tut’s tomb — discovered by English archaeologist Howard Carter to global acclaim in 1922 — was built to be an antechamber to that of the more illustrious and glamorous Nefertiti. 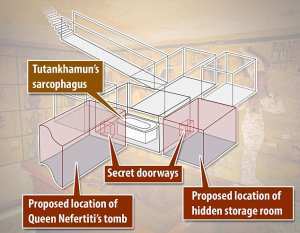 It would also explain some facts about Tutankhamun’s resting place that have puzzled researchers. For one thing, the size of Tutankhamun’s tomb is smaller than those of other Egyptian kings. 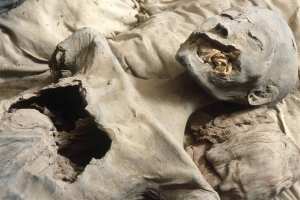 Second, as Reeves writes, many of the artifacts that have enraptured millions of museum visitors around the world are largely second-hand, having been recycled from earlier burials. Finally, the opening in question appears to have been decorated with religious scenes at an earlier date than the other three walls of Tutankhamen’s tomb. The scenes would have been meant to confer protection on the room beyond. Queen Nefertiti: Has the tomb of Tutankhamun's mother been found hiding in plain sight?